Using search box you can list out the recipes based on ingredients and sub recipes. You can also search for any particular recipe. In the above example, "Cherry tomato" is used as an ingredient in 5 recipes. In the above example, "Onion Sauce" is used as a sub recipe in 3 recipes. 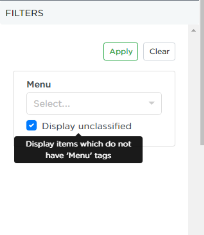 Filters button is used to filter the listed recipes based on applicable categories. Categorization and tagging of recipes should be done to use this functionality. In this example, the recipes are categorized by menu, which is usually the case. You will find more details on classification and tagging here. 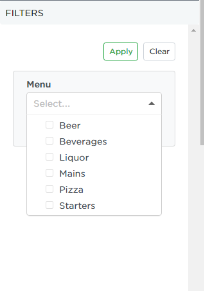 Select the categories from the dropdown and click Apply button to see the recipes that fall under the selected category.